Sanders’ proposal would divide the U.S. into 12 districts that would take work proposals from city, state, and American Indian tribal governments and then pass them to the Department of Labor for final approval. The job guarantee plan is missing some details, like how to pay for it, but Sanders has joined with Democrats in pushing proposals to make sure anyone who needs a job has an option to work on important public jobs like infrastructure, care giving, education or environmental projects, The Washington Post reported. 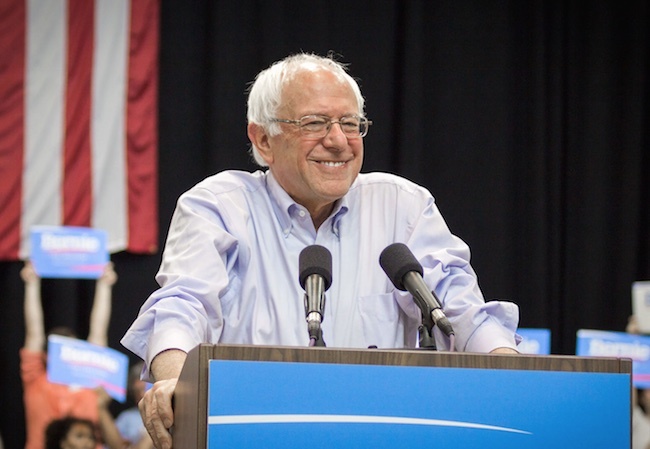 Sanders’ proposal would divide the U.S. into 12 districts that would take work proposals from city, state, and American Indian tribal governments and then pass them to the Department of Labor for final approval, The Post reported. The team hasn’t done a cost estimate for the plan or fully worked out how the program would be funded, a spokesman for his office told The Post. Unemployment rates continue to fall in most places around the country, but several Democrats — particularly likely 2020 presidential candidates — have voiced support for a jobs guarantee in recent weeks. New Jersey Democratic Sen. Cory Booker announced The Federal Jobs Guarantee Development Act Friday, which would authorize and fund the creation of a 3-year pilot program for 15 districts that would provide jobs with a $15 minimum wage and benefits to any resident who needed one. Democratic Sen. Kirsten Gillibrand of California called for a jobs guarantee program earlier in April. “If Republicans could give $1.5 trillion in tax cuts to corporations and the wealthiest among us, why can’t we invest a similar amount in a guaranteed jobs plan for regular Americans who are unemployed and willing to work to better their local community?” Gillibrand said in a tweet. The glut of job guarantee plans signals a move away from the Democratic platform of recent years that valued public-private partnerships and incentives for industries. Instead, the party appears to be leaning toward proposals that push federally funded and managed employment options. Concerned people that want fun, go to the various Fall Fairs like Rutland, Tunbridge, and perhaps others (some days free for seniors) and visit the Republican and Democratic booths, what a diff-Reps are very truthful, friendly and concerned. The exact opposite at the Dems booth, they seem zombied, and can’t answer questions straight forward. What a blast talking with them like arguing with a cow (horse, sheep, chicken, Llama, manure pile. Didn’t mention the wildlife stuff, it’s all the same. Too bad the after Fair time and they weren’t around to ask how they like that the Bern got simplified by the Clinton Machine. I suspect they reversed course and went for the Hildabeast. The Bern never acknowledged that scenario. The cess pool is in force, all the crap floats to the top. Anybody who still is a Bernie follower is a complete idiot. I can’t have a thing to do with anybody….friends, relatives…whatever….who follow this man. They are far too stupid to even bother with. Trying to have a reasonable conversation with a Bernie supporter would be like trying to converse with an ant. Brainless. You are truly a brilliant man, Peter Morgan, on your assessment of Sander’s supporters! No use even attempting to converse with them, regardless of how “close” we are, even siblings can be so screwed up! Fortunately, most of my siblings are NOT for Bernie, and never would be!! My deceased parents would be shocked at those who profess to follow socialist Bernie! Haven’t heard much about the Socialist $15 per hour wage. In reality, it puts low income workers into a higher tax bracket and have to pay more taxes benefiting the Govs. The result is the workers don’t get the higher wage to take home. Slaves to the Govs. This benefits the Bern (Leahy et al) and their controlling Gov. In VT, it’s been double taxation. If sheeple realize this, they might desire the FAIR TAX. But with the FAIR TAX, people can control the taxes paid, not the politicians and their allies the IRS. There’s not too much change in the IRS collection means due to the tax preparers like Turbo Tax, HR Block, etc who want to keep their status quo (businesses). Politicians are paid off, the root of all evil. Ah Bernie. So in addition to this ‘guaranteed job and income’ proposal, don’t forget ‘free college for all’ bit. This could turn my hard earned savings into a way for the socialists to train more socialists into becoming socialists. What could go wrong with that? Then his wife could start a new college and I would be forced to pay her and it to totally destroy our country. Oh, and since I worked for and paid for my college education many years ago, can I get a refund? I could sure use the money at todays value of the dollar. “The job guanatee plan is missing some details?” A long time ago a man said “the devil is in the details”, and it still holds true today. This is just another one of Bernie’s feel good pipe dreams. See how they use language to distort reality–“giving” tax cuts to corporations. But they are not giving to the corporations, they are taking less from them. The money still comes from what the corporations earned. Inside out thinking, but who cares about that? They are “giving” our country more debt. It can’t go on forever. Have your wife run a Burlington college in the ground and they file bankruptcy and wifey get a $300,000 bonus for doing so. How does a poor boy living on a dirt floor house, become a millionaire and buy expensive properties on Lake Champlain? Work for the gov and BS your way around. AH isn’t Socialism great? Remember, Libs want what you have and they want to keep what they have. The Clinton machine had him figured out before he ran for Prez and didn’t counter. He must have been bought off and allowed to keep his Prez running money. People were duped and doped. I want to take his job offer. BUT, I want to make it like he has. I want to be a millionaire by “serving the people” just like BERNIE. WHAT ARE MY CHANCES? must think the money falls from Heaven. Hey taxpayers … Feel the Bern. Finland tried a quranteed wage, and just a few days ago scrapped its scheme because it was unworkable. Don’t tell that to Bernie supporters. They are ‘true believers’. Wouldn’t be surprised if a SandersTown showed up somewhere in South America, complete with Koolaid. Bernie always has a plan. He’s always been great on running his mouth and causing hate and discontent but he never accomplishes anything. Can anyone name 5 things that he has done since he’s been a Senator? I can’t think of them but I’m sure the socialist can name one. The Bern when chair of the Veteran Senate Committee pissed on Vets. I know, wrote about personal concerning issues and NO ANSWER. A complete incompetent jerk sucking the taxpayer teat. If there’s a camera, he all smiles and also being tight lipped when a difficult question is asked. The fuzzy hair is a sign “of a hard caring slave”, right???? The first (and last) time I attended a Statewide American Legion convention, they let this loser rush in, speak, and leave without taking a single question. I refuse to attend another convention until this commune reject is absent.